Viewed from the street this unassuming family home hides a secret; a cluster of interconnected pavilions with an oval courtyard garden at their centre. 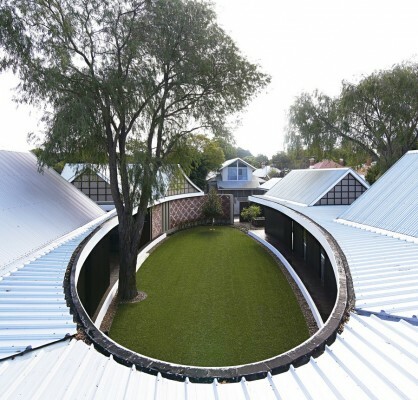 The publicly visible faces of the pavilions, aligned with the square geometry of the level block of land, are respectfully attuned to homogeneous character of the early 1900s federation era Subiaco streetscape – one of the best preserved suburbs in Perth – in the small scale of their pitched rooves, the updated interpretation of the traditional veranda that surrounds them, and the criss-cross pattern formed in the brickwork reclaimed from the dilapidated buildings that previously occupied the plot. This commitment to ensuring the new building’s façade is sympathetic with its period surroundings has led to it being enthusiastically adopted by the neighborhood, yet stepping through the front entrance reveals this home to be anything but square. The elliptical courtyard, which runs diagonally through heart of the house from the front door to the back gate, is the focal point of the home in terms of both design and use. The courtyard divides the bedrooms from the living space with the entrance hall in the centre. From the entry one can view the whole courtyard with the living and bedroom wings flanking it, it is a very intimate and private space, minimally landscaped with a lawn, enhanced by a couple of mature growth trees existing on the block. 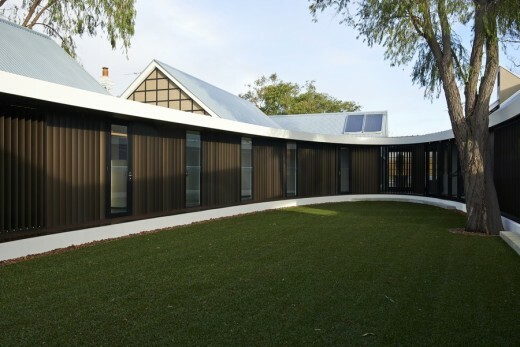 Externally the oval is bordered by another veranda with its Jarrah timber deck set at seat height, which provides the family with a theatrical open space to play and entertain that is visible and easily accessible from wherever they are in the house. 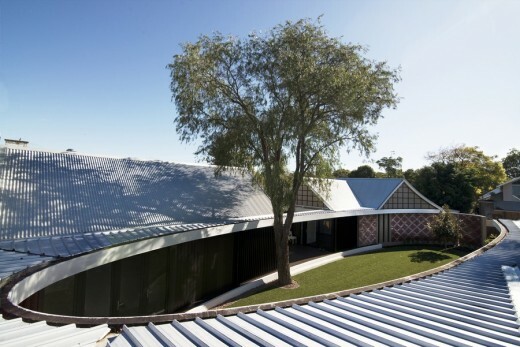 It also showcases some of the more contemporary elements of the building in details such as the Luigi Rosselli Architects designed profiled aluminium wall cladding to the veranda and vertical sun shade louvres. Internally the courtyard lends its form to the surrounding buildings in the curves of the connecting corridors and partition glass panelling. The interiors of the house reflect the constructive tension in its timeless aspects such as the pitched roof forms, enhanced with exposed timber trusses and painted tongue and groove lining boards, small paned windows and traditional French doors, with the more modern materials such as the polished concrete and black steel fire surrounds, contemporary joinery finishes and Scandinavian furniture.